Los presidentes de Perú, Chile y Colombia, junto al ministro de Economía mexicano, participaron en un foro sobre la Alianza del Pacífico en Nueva York. 10:00 | Lima, Nov. 17. 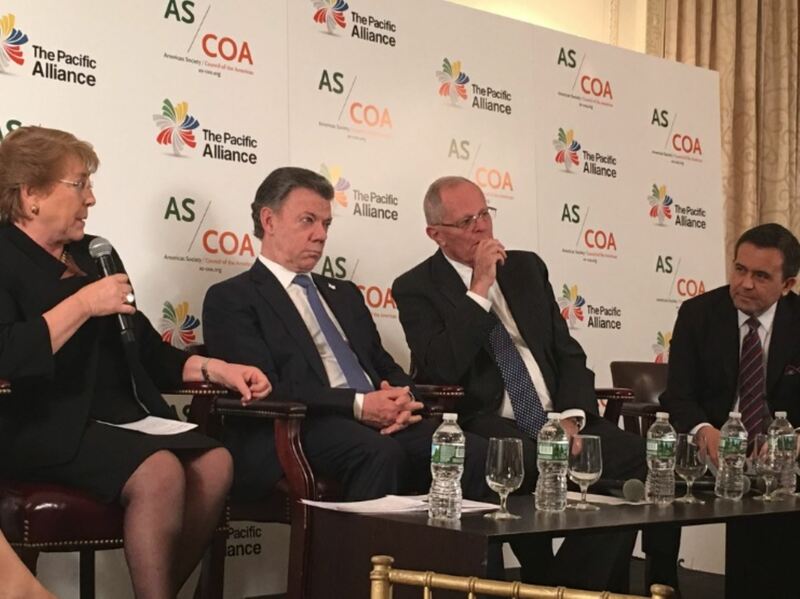 The Pacific Alliance (PA) —regional bloc composed of Peru, Mexico, Chile and Colombia— is an excellent integration initiative on this side of the region, Pacific Economic Cooperation Council (PECC) Secretary-General Eduardo Pedrosa underlined. The bloc's relevance lies not only in its trade exchange, but also in the integration its member economies are reaching, he affirmed. The PECC official also highlighted the meeting between PA nations and Asia-Pacific Economic Cooperation (APEC) Forum's economies, as part of Leaders' Week currently underway in Lima. In this respect, APEC Leaders are paying increasing attention to the PA, and both integration blocs have plenty to learn from each other, Pedrosa observed. APEC 2016 Leaders' Meeting, taking place on November 19-20, will also feature Presidents Pedro Pablo Kuczynski (Peru) Michelle Bachelet (Chile), Enrique Peña Nieto (Mexico) and Juan Manuel Santos (Colombia). While not an APEC Forum economy, Colombia has requested accession to the bloc. Its Leader Juan Manuel Santos has been invited to attend the APEC CEO Summit and will participate in the informal dialogue between PA and APEC. On the other hand, Pedrosa regards new incorporations into the APEC Forum are not very likely given the lack of a membership-expansion policy. Integration is one of the vital achievements, he noted.